For the 1st time ever get two years of guaranteed pricing.Total savings can be more than $300! Showtime®, HBO®, Cinemax® and DISH Movie Pack® FREE for 3 months. DISH Network’s premium packages deliver exciting, original programming and hit Hollywood movies spanning all genres. Not only can subscribers to DISH Network’s premium packages watch award-winning original series, they can also enjoy sporting events, including boxing matches. Protection Plan Included for 6 Months! Let our experts bring satellite television into your home for FREE! You’ll receive a professional installation from a highly trained installer, who will properly mount, align and peak your dish on your roof, balcony or other location within 100 feet of your TV. You’ll also be shown how easy it is to use your system and DISH Network service. Installation dates are available 7 days a week nationally. We will also work aggressively with you to ensure that your DISH is installed as soon as possible. Our installers are certified, insured and have a 90-day installation warranty. These days it’s easy to compare the prices of digital cameras, DVD players and even cruises, but trying to compare and find the best and cheapest DISH Network Satellite TV deals isn’t as easy. 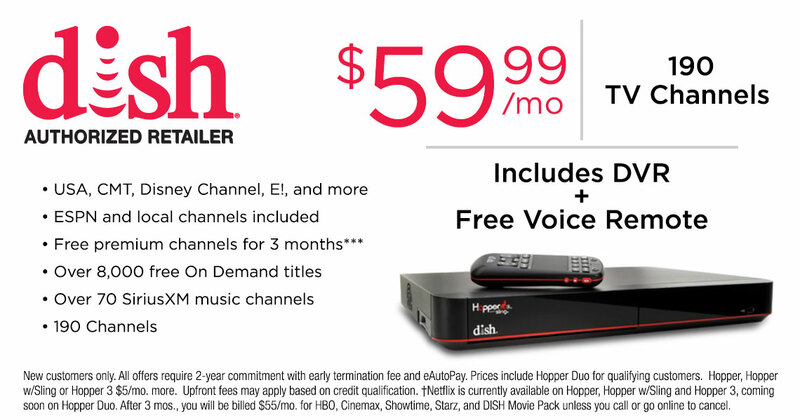 DISH Network by DISH Systems is the place to learn, compare and research the latest and best DISH Network satellite TV deals available. DISH Network by DISH Systems will advise you on how you can get a cheap satellite TV bill so you can enjoy digital television and not worry about an expensive cable bill. Dish Network plans from Dish Systems gives you the assurance that you are getting the best satellite TV deal and the cheapest all-digital price for Satellite or Cable television in the nation every day. So no matter what so-called deals cable advertises, be assured DISH Network has the best and cheapest satellite tv deals & offers available. It’s easy to find the best satellite TV deals – call us! DISH Systems is a leading nationwide authorized DISH Network Dealer. That means you are guaranteed to get the best price, newest equipment and the most HD programming available through a variety of Dish Network plans. A highly-trained DISH Network new-customer care representative will ask you a few simple questions to find out what package is best for you. Like what channels you are interested in, how many televisions are in the house, and how many HDTV’s you have. The customer care representatives are not paid commission for what programming package you buy, so you can feel comfortable with picking the channels you want to watch. Best of all, with DISH Network you can upgrade you programming package at any time without any upgrade fees!